Our organically crafted Rosemary Body Butter is an aromatic herbal extract butter of the richly aromatic flowers, leaves and twigs of the Rosmarinus officinalis plant into our proprietary exotic butter base to produces a smooth, velvety butter with fresh herbaceous, woodsy aroma which melts quickly into the skin upon application. With this exotic butter we get the skin nourishing and aromatherapeutic properties of the Rosemary herb in a luxurious, easy to use butter base that will add amazing skin feel to any emulsion, or anhydrous formulation. Besides brightening and clarifying all complexions, Rosemary Butter can help calm irritations, blemishes, bumps, and roughness. It works on the middle layers of the skin, soothing and healing from the inside out. Rosemary Butter also has analgesic properties, giving it a little extra punch in helping to relieve pain associated with various skin irritations. 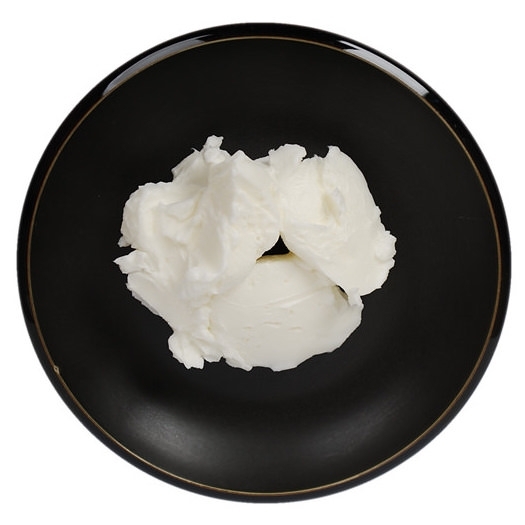 The topical use of Rosemary Butter has been found to improve blood circulation in skin cells. Improved blood circulation can offer a host of other benefits like relieving pain and aiding rapid blood clotting, which could, in turn, speed up wound healing and promote hair growth. Rosemary Butter also has excellent anti-fungal properties that effectively cleanse the white flakes and nourishes the scalp. Energetically and emotionally, the aroma of Rosemary Butter is very energizing and uplifting and, traditionally, has been known to help with mental clarity.